Since the beginning of the year, i've been good and haven't bought any products of any sort , mainly because I told myself I couldn't till I finished up at least 10 products. 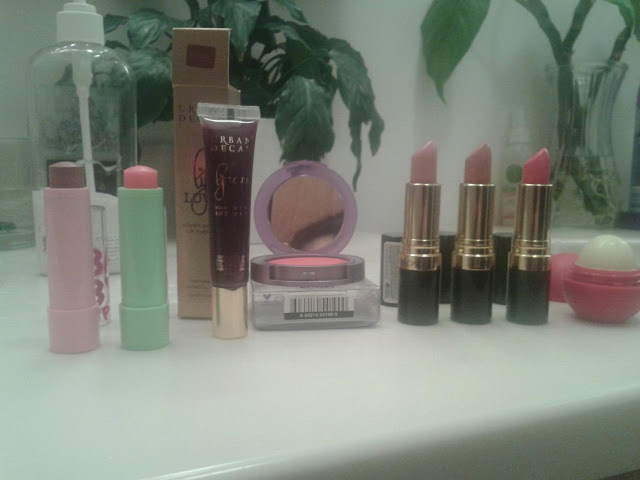 And Since I did (post on those empties soon) I decided to pick up some items i've been eyeing and looking for! 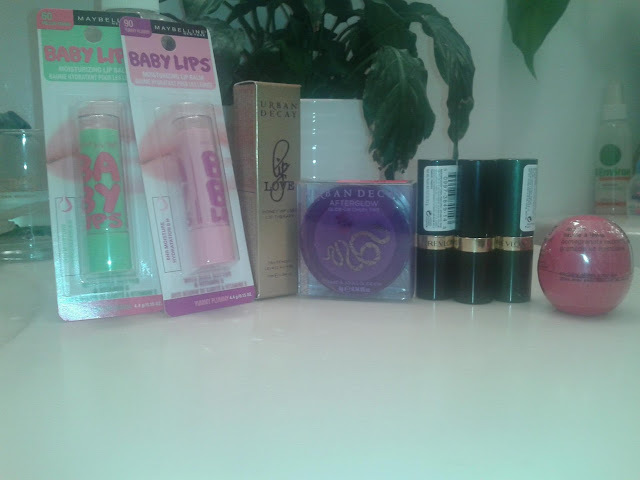 (except the Urban Decay products which I bought because they were on a super deal). From Left to Right: Maybelline Baby Lips in Limited edition flavors--Melon Mania and Yummy Plummy. It took me awhile to fine the Melon one but finally did at Rite Aid! ($3.99/ea). The Urban Decay Honey infused lip love in Stung ($6.00 on Hautelook) and cheek tint in Bang ($6.00 on Hautelook)--I honestly bought this because of the Snake pattern on it, I'm a sucker for snakes. Then two Revlon Lustrous Lipsticks- Primrose ($2.99 at Target since I had a 2 dollar off coupon) and Pink in the Afternoon ($4.99 at Rite Aid-Weekly Sale). Then lastly of course, to add to my collection of egg balls, the EOS lip balm in Pomegranate Raspberry! ($2.99 at Drugstore.com). Same items, but opened from the package. I may review these later. For sure the Urban Decay Lip Love since I've already tried it and I love it so much.